Whether you begin to color your mandala from the outside or inside can also give you insight into your mind and meditation. 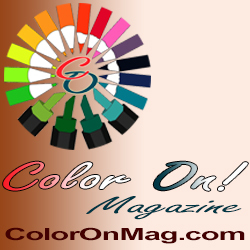 It has been suggested that when you begin coloring the mandala at the outside edge and make your way inward toward the center, you are exploring your inner self. Conversely, working from the center of the mandala outward can help you feel more connected to the universe around you. He doesn’t mention what it means if you start in the middle and head in both directions, though, which I’ve been known to do on occasion! *grin* Either I can’t make up my mind about whether to explore myself or the universe, or maybe I’m multi-tasking? 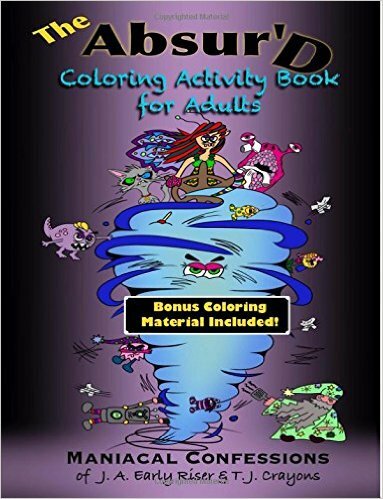 Anyway, in The Mandala Coloring Book, you’ll find 100 of Jim’s drawings to color, whichever direction you choose. Unlike many mandalas books I’ve reviewed, the mandalas Jim draws have a very organic feel to them. It’s not that they aren’t symmetrical – they definitely are! But something about the shapes and lines suggest something that evolved rather than something meticulously calculated. Which is interesting, because the uniformity of the line widths suggest that Jim uses a digital medium to create his designs. 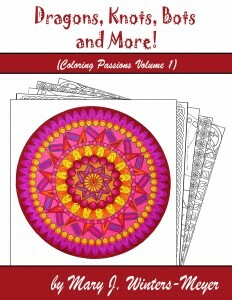 In any case, if you like mandalas, the 100 designs in this book should keep you occupied for a while!